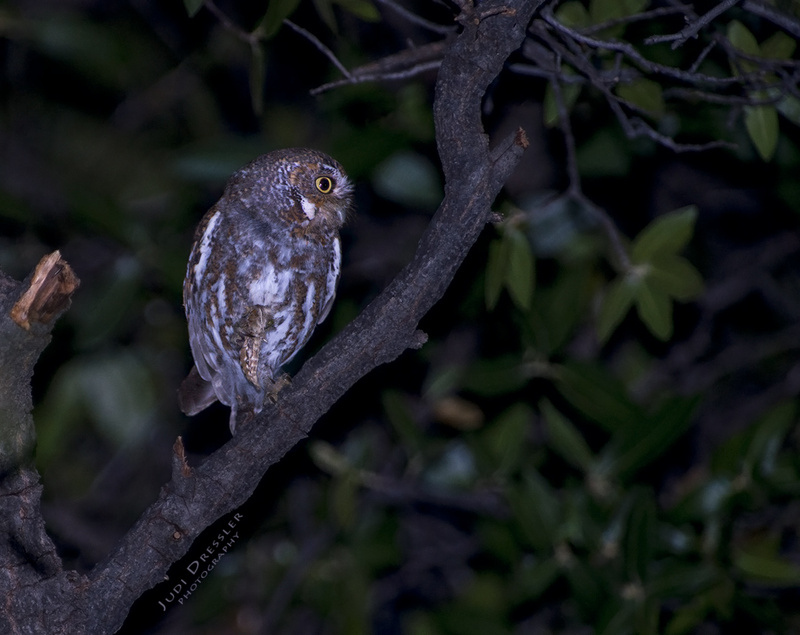 I felt to lucky that we got to see this tiny Elf Owl (micrathene whitneyi), while on a trip to Arizona. We saw two different ones, actually — the first time up a canyon where we heard them and then suddenly saw one fly but I wasn’t able to get a picture, and then later, we met someone who actually had them nesting in a tall wooden pole in his back yard. We saw the owl fly out of the pole and then, after a moment of “where did he go?”, we found him in this tree, holding a grasshopper in one talon — a decent meal for this tiny owl! These owls really are tiny — about the size of a sparrow(! ), and yet they are raptors and kill to eat!